It’s time to close the senior SNAP gap! Explore our new interactive mapping tool, developed with AARP Foundation, to see how many eligible seniors (60+) are using — and missing out on — SNAP in your state. One in 10 of the nation’s 43.8 million households with seniors (age 60+) participated in the Supplemental Nutrition Assistance Program (SNAP), on average each year between 2012–2016. This is according to U.S. Census Bureau data analyzed in interactive tools released today by the Food Research & Action Center (FRAC), in collaboration with AARP Foundation. In just 60 minutes, health care providers and community-based partners can learn how to screen patients age 50 and older for food insecurity and connect them to key nutrition resources like the Supplemental Nutrition Assistance Program (SNAP). The course, developed by FRAC and the AARP Foundation, is approved for 1.0 AMA PRA Category 1 Credits™ (MDs and DOs). All other learners can download a certificate of participation upon completion of the course. See the course for more information. One in 10 of the nation’s 43.8 million households with seniors (age 60+) participated in the Supplemental Nutrition Assistance Program (SNAP), on average each year between 2012–2016. Too many of our nation’s seniors struggle against hunger. Three million households with at least one adult age 65 or older are food insecure. Millions more households with seniors face marginal food security. In 2017, 9.2% – 4.7 million – of the 51 million people age 65 and over in the United States lived at or below the poverty level. In 2017, three million food-insecure households included a senior age 65 or older. 1.2 million seniors age 65 or older who lived alone were food insecure in 2017, and approximately 524,000 of these seniors were experiencing very low food insecurity. SNAP benefits an average of approximately 4.7 million households with at least one senior age 60 or older. Even so, 3 out of 5 eligible seniors miss out on SNAP. The average monthly SNAP benefit for a senior age 60 or older was $101 in fiscal year 2017. Coleman-Jensen, A., Rabbitt, M. P., Gregory, C. A., & Singh, A. (2018). Household food security in the United States in 2017. Economic Research Report, 256. Washington, DC: U.S. Department of Agriculture, Economic Research Service. Fontenot, K., Semega, J., and Kollar, M., U.S. Census Bureau, Current Population Reports, P60-263, Income and Poverty in the United States: 2017, U.S. Government Printing Office, Washington, DC, 2018. SNAP is the first line of defense against senior hunger. is available to every eligible senior, in every corner of the country. provides seniors with significant food purchasing power every month of the year. improves food insecurity and health, helping seniors to maintain their independence. reaches by far and away more seniors than any of the federal nutrition programs available to seniors. In fiscal year 2016, SNAP served an average of about 4.7 million households with elderly individuals (age 60 or older) each month, but SNAP could reach millions of more eligible seniors. In addition to SNAP, seniors could be eligible for additional federal programs depending on their income, health status, age, and whether the program is available in their area. Source: Lauffer, S. (2017). Characteristics of Supplemental Nutrition Assistance Program Households: Fiscal Year 2016. Alexandria, VA: U.S. Department of Agriculture, Food and Nutrition Service, Office of Policy Support. Only an estimated 45 percent of eligible seniors participate in SNAP. This compares to 88 percent of non-elderly adults. Why? One of the key strategies to addressing senior hunger is to connect more eligible seniors to SNAP. 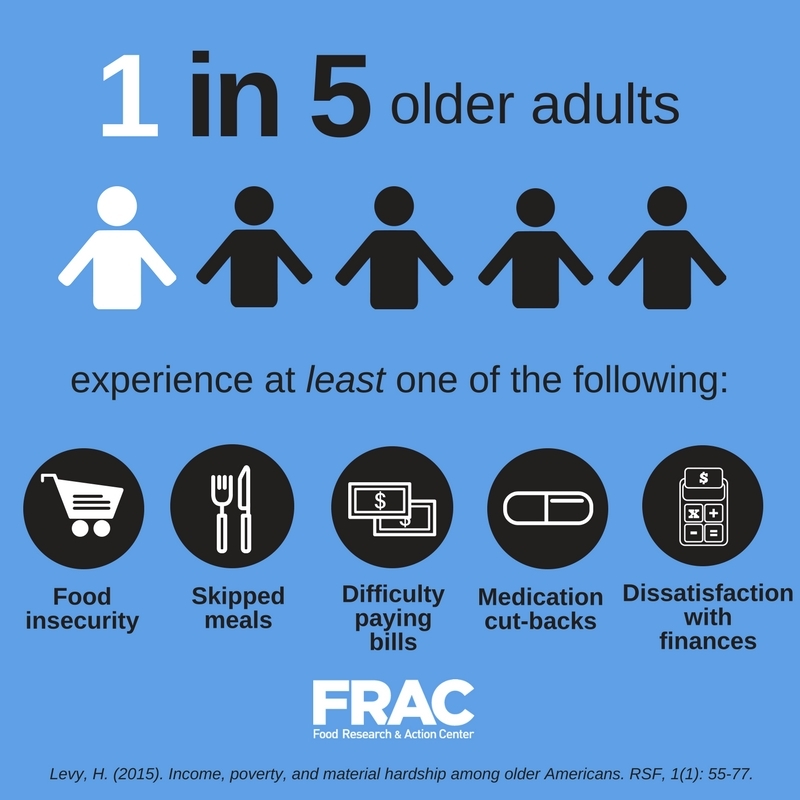 To improve participation, FRAC is working to remove barriers facing seniors through federal legislation that will improve benefit levels, and by partnering with state officials, advocates, service providers and other stakeholders to strengthen state policies. Source: Cunnyngham, K. (2018). Trends in Supplemental Nutrition Assistance Program Participation Rates: Fiscal Year 2010 to Fiscal Year 2016. Alexandria, VA: U.S. Department of Agriculture, Food and Nutrition Service, Office of Policy Support. Older adults may reside in a household with children under 18 years of age (e.g., their own children, grandchildren), which can increase the likelihood of experiencing food insecurity. Parents and caregivers often try to protect children from food insecurity by, for example, sacrificing their own food and nutrition needs so that the children can eat. Rates of household food insecurity are 1.5 times higher among households with any children present (compared to households without children). Rates of household food insecurity are two times higher among households with a grandchild present (compared to households without a grandchild present). Do, D., Rodgers, R., & Rivera Drew, J. A. (2015). Multigenerational families and food insecurity in the United States, 1998-2013. Integrated Health Interview Series, Data Brief No. 1. Coleman-Jensen, A., Rabbitt, M. P., Gregory, C. A., & Singh, A. (2017). Household food security in the United States in 2016. Economic Research Report, 237. Washington, DC: U.S. Department of Agriculture, Economic Research Service. Ziliak, J. P., & Gundersen, C. (2016). Multigenerational families and food insecurity. Southern Economic Journal, 82(4), 1147–1166. A toolkit from FRAC and the AARP Foundation. Thousands of Maryland seniors struggle to put food on the table. Thanks to legislation pushed by Maryland Hunger Solutions, that struggle became a little bit more bearable.